I always wanted to make my own Bon Bons with their own little box and give as a gift...problem is...I end up eating them all...especially these coconut filled delights! In a small bowl stir together softened cream cheese, sifted icing sugar and vanilla until well combined. Stir in coconut and nuts. Chill the mixture for about one hour. Shape into round balls about 2.5cm thick. Melt the chocolate. 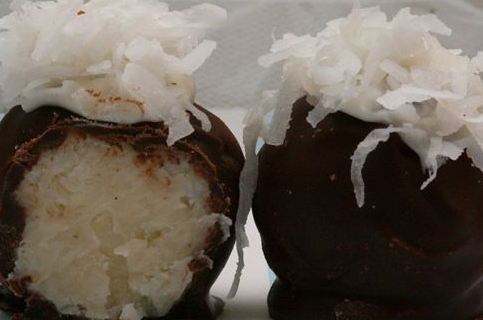 Dip coconut balls into the melted chocolate. Do this by dropping the balls into the chocolate one at a time. Turn with a fork. Lift the ball with your fork and tap on the edge of the bowl to remove the excess chocolate. Invert the dipped centre onto a baking paper on a tray. If too much chocolate pools at the bottom, next time allow more chocolate to drop off the fork. I like to splash a little more shredded coconut on top...but you can keep them as solid little chocolate balls if you like! Once the chocolate sets they are ready to eat! If it is too hot you should refrigerate otherwise keep in a cool dry place. Sachertorte - Chocolate cake on steroids!